Here are the steps to use a Google Font in your web app. Go to fonts.google.com and click on the name of the font to go to its page. As an example font to try, search for the font called "Orbitron" (use the search field in the top right) and then click it to display its font page. On the Orbitron page, click "SELECT THIS FONT" in the top right. In your Xojo web project select the App and then click the "pencil" icon next to the HTMLHeader property in the Inspector to show the editor. Paste the text you copied from above into the editor for the property. Add <style></style> tags to the editor. Go back to Xojo and in the HTMLHeader property editor, add this CSS in between the curly brackets. Create a new Web Style and give it the name of the Google Font. This is case-sensitive so make sure it matches exactly. For Orbitron, the Web Style should be called "Orbitron". 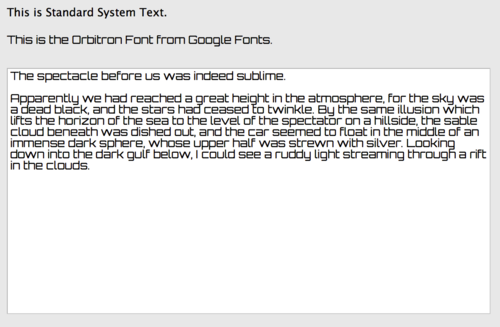 On WebPage1, add a Label (or a TextField or a TextArea) with some text and change its Style property to Orbitron. Run your project. The text should appear using the Google Font. To use multiple Google Fonts in your app, add additional HTML to the HTMLHeader as described above for each font you want to use and create the corresponding Web Style. Note that the Google Font only shows when you run the project. It does not show in the IDE Layout Editor. And remember, Google Fonts are always loaded from the Internet, not locally, which may cause your web app to load more slowly as the font is fetched. This page was last edited on 2 April 2019, at 19:25.